I wake up at 2am with a parched throat and feverish brow. Still busy processing anaesthesia and the horror of surgery. I reach out to take a sip from the water glass next to my bed and feel a soft caress on my cheek, followed by a feathery touch on my hand and then something lands in bed next to me with an audible plop. With a girlish shriek I levitate several feet into the air, and hang there while groping for the light switch. I do not appreciate supernatural visitations in the middle of the night. In blazing light, and with reason restored, I shake out blankets in search of the mysterious being, and am rewarded with an awesomely large arachnid. My eight legged visitor was shooed into a plastic dish and deposited in a far corner of the garden. I don’t mind spiders nearly as much as ghosts. But I don’t share my water with just anyone. I’m getting a tankard with a hinged lid! 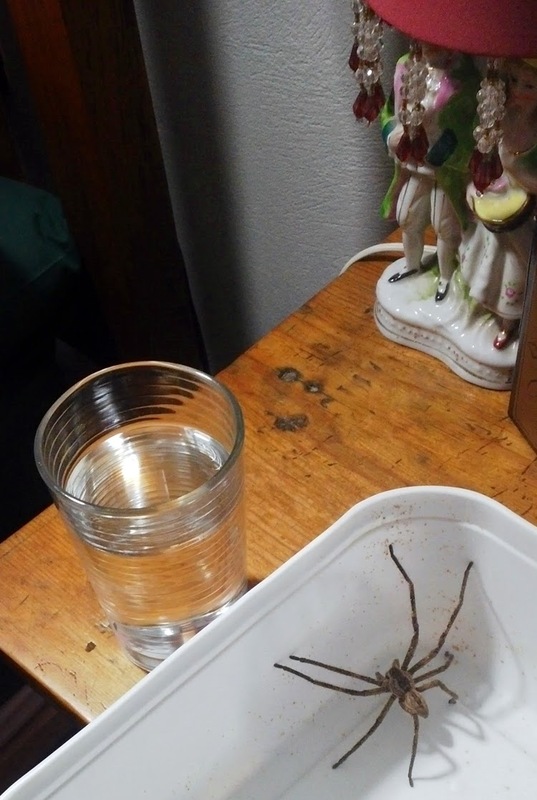 If you thought spiders drinking from your water glass is a myth, here is conclusive evidence to the contrary. While we sleep, the creepies do come out to take a sip or two.